In looking at this Town of Menasha project post-construction and trying to describe it, listing what we didn’t do would be easier than listing what we did. About a half dozen trees and a dozen shrubs in the entire landscape were spared, as were large portions of the lawn and some of the concrete curbing. The rest was either gutted or staged for future re-use. 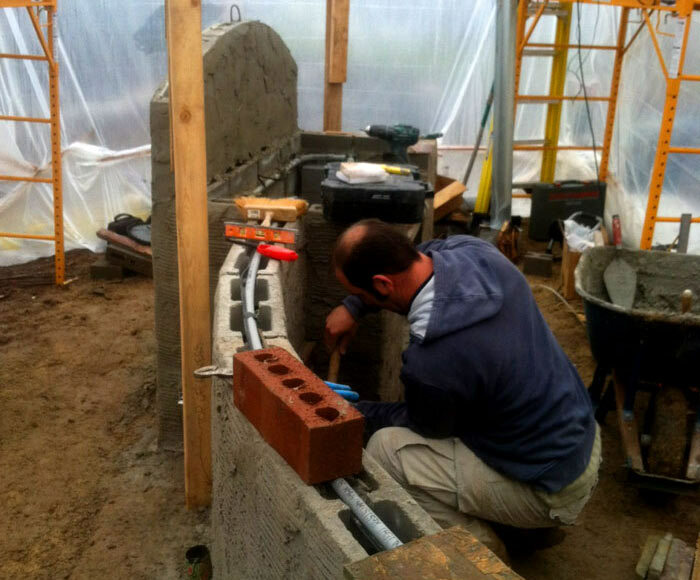 The project began late in the fall, so we enclosed some of the masonry areas to continue work into the winter. 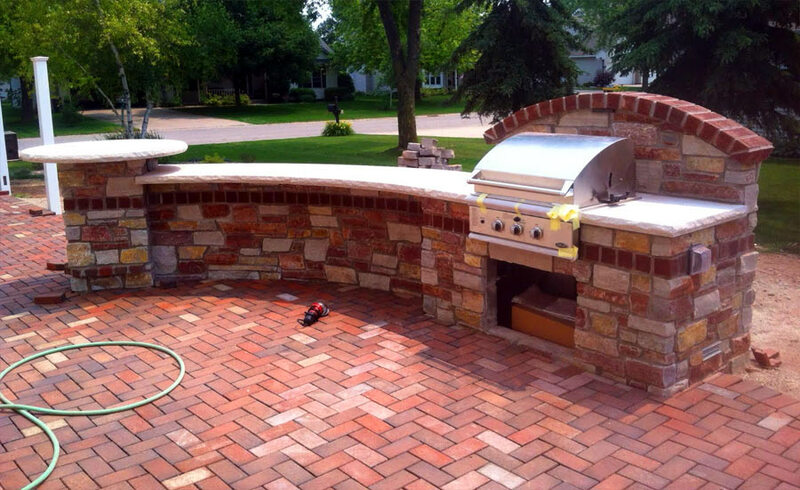 Here you see work being done on the built-in grill island that will soon house a DCS grill (one of our favorite brands). 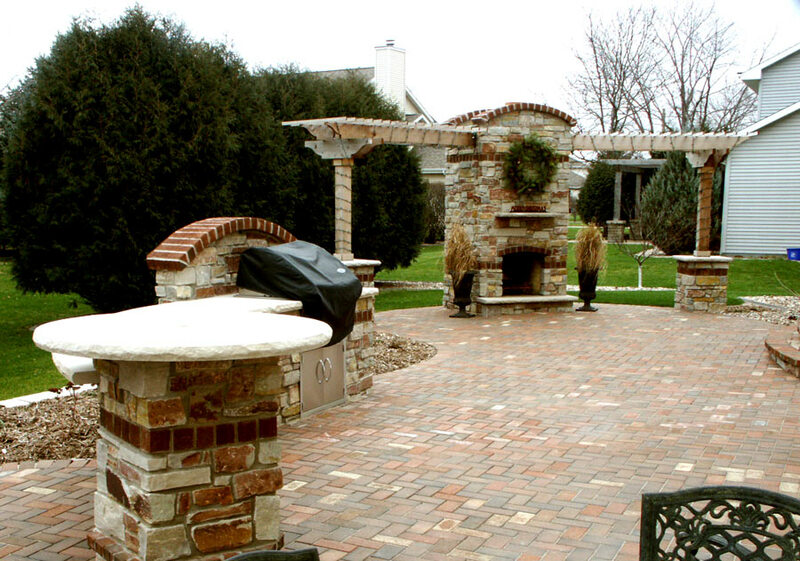 The hardscape portion of the project included a masonry fireplace with flanking arbors, the built-in grill with curved countertop for dining, a masonry bistro table with custom-welded sun umbrella sleeve, switched low voltage lighting for ambience, cooking and navigation. We moved and re-wired the existing hot tub, re-installed the privacy fence in a new location, built a new masonry patio step with lighting, veneering the front steps in stone and a cut paver, and then re-using the pavers from the previous patio (adding approximately 500 square feet to the total paver area in the process) and re-building a new and improved patio space and front entry. 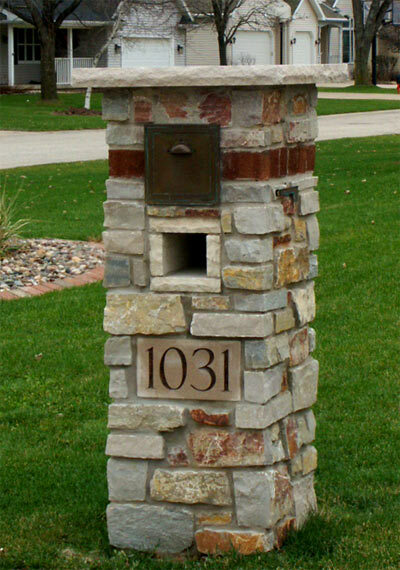 We even did away with the old resin mailbox and replaced it with a stone veneer-over-masonry CMU mailbox, complete with a custom copper flag we fabricated and patina’d ourselves. Many hours were spent crafting the details in this project, and we hope this client will appreciate and enjoy the work that went into those details for years and years. And the hardscapes weren’t the only thing we did. 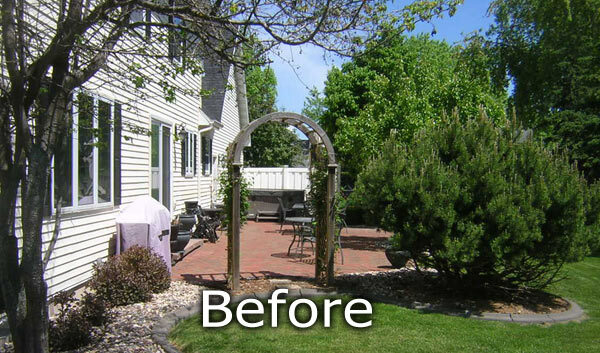 Included in this project were hundreds of perennials, shrubs and trees, to more beautifully frame this client’s new hardscape.